After more than a year's wait, the deal between Richard Childress Racing and Jeff Burton is finally a done deal. Starting at Michigan, Burton will take over driving duties for the No. 30 RCR Chevrolet. Photo by Dan Helrigel - IRL. "Jeff will bring a great deal of experience and knowledge to the America Online team and all of RCR," said Richard Childress. 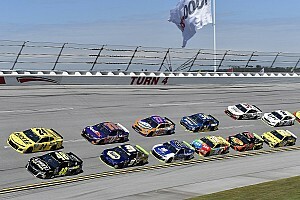 "I know back in 1998 and 1999, Dale Earnhardt talked to Jeff quite a bit about driving the No. 3 car when he retired. Then Kevin [Harvick] came along and the plan shifted toward him but Jeff was one of the few people we kept an eye on to be in our organization." The No. 30 team has been plagued with poor results since the team started in 2002 with driver Jeff Green. Green was replaced by Steve Park in 2003, but results did not improve. RCR announced at the Cup series banquet in December of 2003, that Johnny Sauter would take over the wheel of the No. 30 at the start of the 2004 season. Sauter made only 13 starts this season, with lackluster results, before being replaced by Dave Blaney. With the addition of Burton to the RCR stable of drivers, it finally brings full circle Childress' quest to hire a top-notch driver to fill the seat of the struggling team. 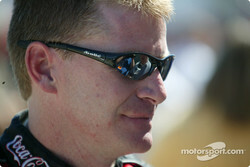 "I've really watched Jeff's talent and his ability to race for a championship," Childress said. "He is a driver who knows how to get the job done and we're going to give him what it takes to be a championship contender." NASCAR truck series driver Carl Edwards will step into the vacated No. 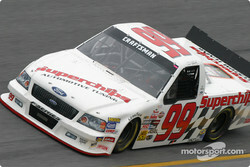 99 Roush Ford of Jeff Burton, also beginning at Michigan. Edwards, who sits third in Truck series points, will continue to fulfill his obligations to that team through the remainder of the year. "This unexpected window of opportunity has been made possible through Jeff Burton's decision not to execute his option to drive the No. 99 Ford Taurus in 2005," commented Jack Roush. "Carl will follow in the footsteps of Kurt Busch, Greg Biffle, Matt Kenseth, Mark Martin, and Jeff Burton in being supported by Roush Racing's best people and hardware at a time when his experience and motivations are certain to propel him into NASCAR's most elite group."